Days Two and Three a Vegan… – Eat, Drink, and Go! It’s going well and I’m definitely atoning for the gluttonous indulgence of the food show by depriving myself of meat and cheese for a couple days. So last night, I made a delicious dinner, some of it inspired by one of the products I’ll be featuring in my show review, part 3. 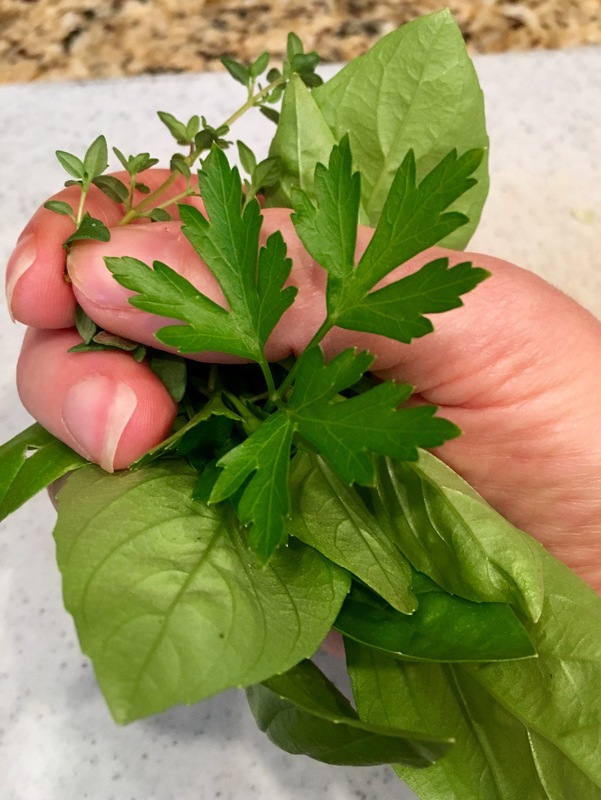 I started with fresh basil, parsley, and thyme from my herb garden, which is doing pretty well so far this season. So pretty!! 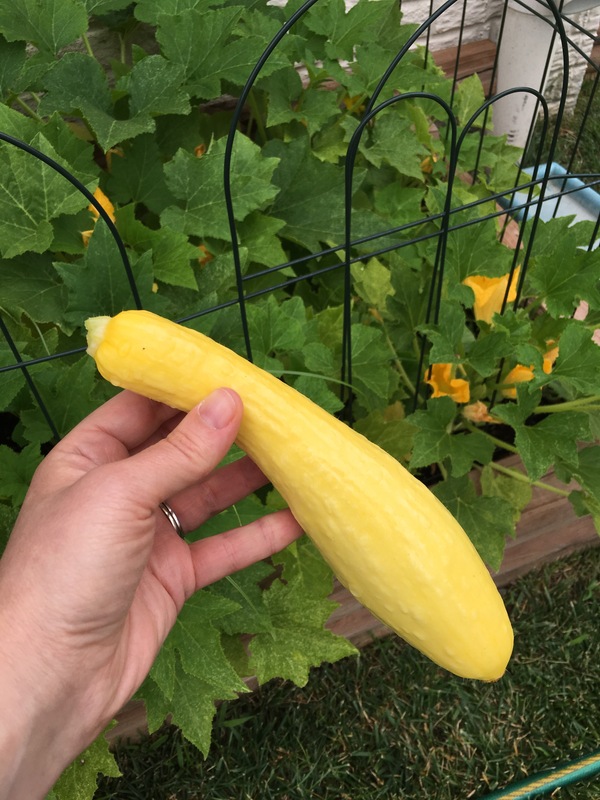 Then I grabbed the first summer squash to grow in my vegetable garden – so cute! Do you know who also lives in there? A tiny baby bunny!!! Awww. 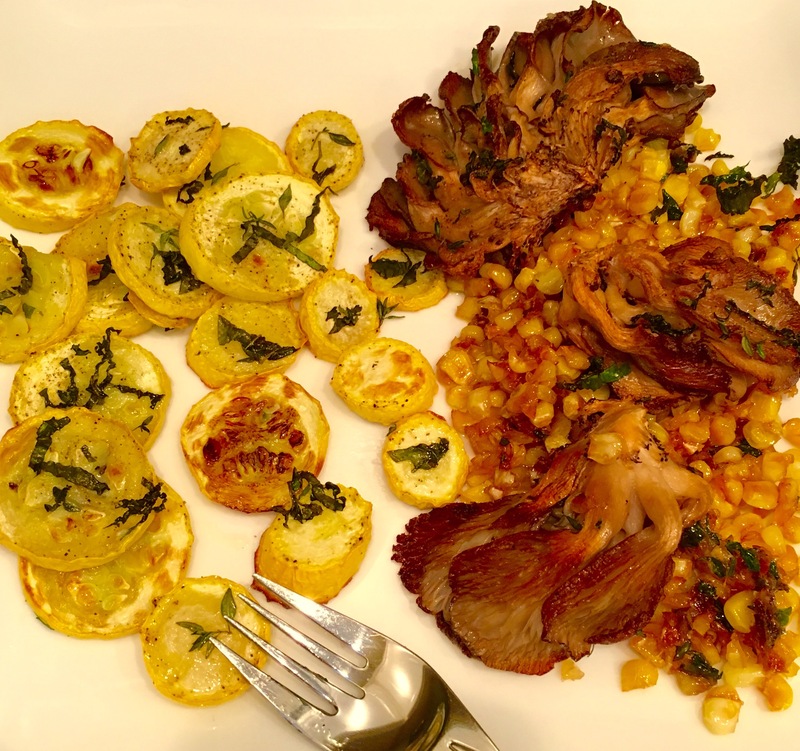 I chopped up the fresh herbs and topped the squash and some oyster mushrooms with them and drizzled with EVOO, then roasted for a while. 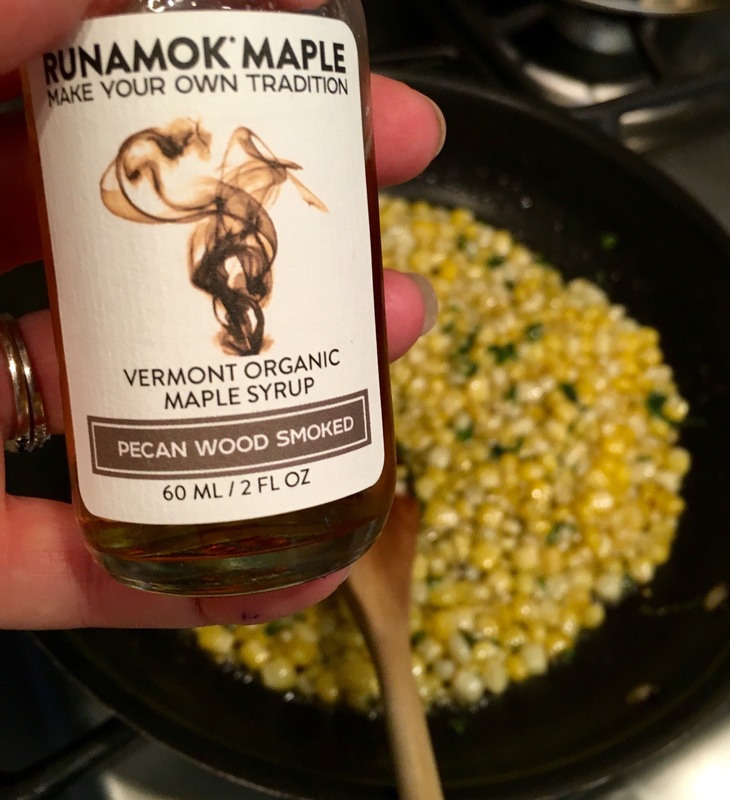 While that was roasting, I cut some fresh corn off the cob and sauteed in a bit of avocado oil (to be written about in next review) and Runamok’s pecan wood smoked maple syrup. Loved this stuff!! The corn got all caramel glazy and I tossed in a little of the fresh herbs too. When everything was ready, I had a beautiful vegan meal that actually satisfied – mushrooms can make you think you ate meat and I love oyster mushrooms when you roast the hell out of them with some EVOO and a little season, truffle salt and pepper is always good!! And ta-da, my dinner of day two a vegan! On today, day three, I made a delicious simple salad for lunch. 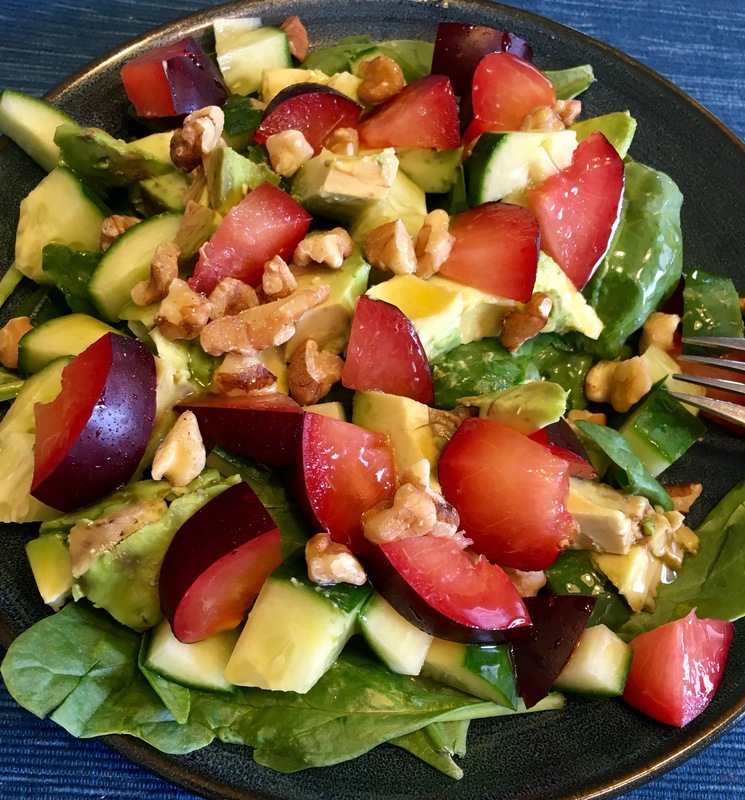 Just spinach, cukes, avocado, and plums drizzled with some of JD Gourmet’s mango white balsamic. It was an excellent salad!! And so beautiful! My veganism will conclude when I get to the beach tonight and get me some fresh Carolina seafood!! More blogging about that to come and stay tuned for the rest of my Summer Fancy Food Show reviews!! How beautiful you make those veggies look! The peak at you garden is so cool – so very from farm to table! Yet he plums are the prettiest I’ve seen and add such deep rich color to your stunning plate! That Runamuck looks so great, plus I love the name. You go girl!!! Love it – makes me want to go to that Show!